Miltenyi Biotec is a leading supplier of flow cytometry products, offering one of the broadest portfolios of antibodies, kits and, support reagents available. MACS® Flow Cytometry kits allow flow cytometry users to perform sophisticated analyses right from the start. All kits have been optimized to achieve reproducible results, saving valuable experiment set-up time and assay costs. Support reagents include instrument support reagents, sample preparation reagents, fluorescence amplification reagents, and a broad range of kits to check cell viability and cell labeling, as well as antibody conjugation and cell staining kits. Use the product finder below to identify the product that best suits your needs. Detection and analysis of apoptosis and cell viability by flow cytometry. Antibody kits for the identification and enumeration of immune cell types, stem cells, tumor cells, and rare cell populations. 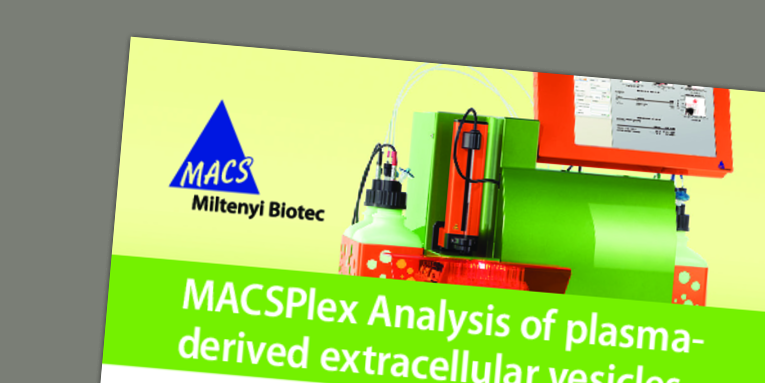 MACSPlex Assays for flow cytometric detection of miRNA and quantification of exosomes and proteins via beads. Fast intracellular cytokine detection with MACS Cytokine Secretion Assays. Buffers and beads for improved flow cytometry analysis.